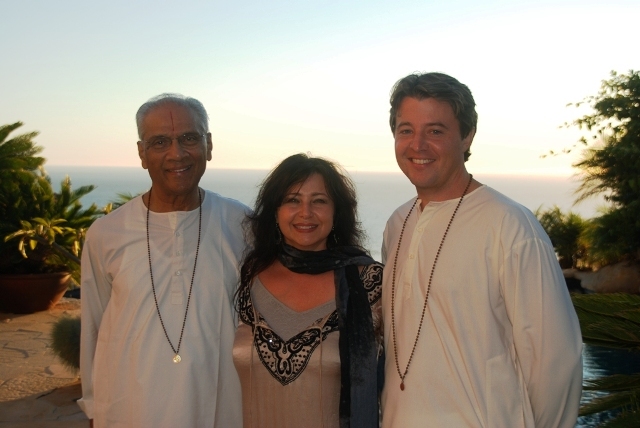 Swami Parthasarathy shares words of wisdom in Malibu | Joan Valentine - A Foundation for Natural Cures, Inc.
Swami Parthasarathy, an internationally eminent philosopher widely acclaimed as the greatest living exponent of Vedanta, has spoken at the Aspen Ideas Festival and addressed leading institutions such as the World Economic Forum, The World Bank, NASA, and Harvard Business School. 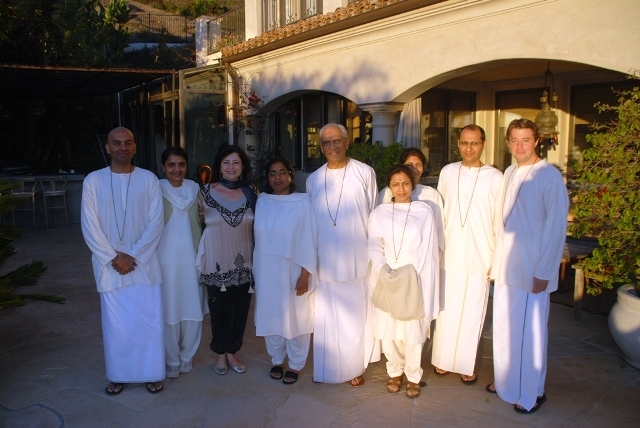 Recently, Swamiji, as he is popularly known as, shared words of wisdom at an intimate gathering at the Malibu home of Dianne Burnett, founder of Joan Valentine — A Foundation for Natural Cures, Inc.
Vedanta is derived from two words Veda – Knowledge, and Anta – End. Vedanta means the end of knowledge. This ancient philosophy presents the eternal principles of life and living. It programmes a life of mental peace combined with dynamic action in the world. Equips one with clarity of intellect to deal with the challenges of life. Above all, it’s philosophy leads one to the ultimate goal of Self- Realization. Q: You come here every year. What’s the biggest change you see with Americans, who are usually viewed as so materialistic? A: I find them receiving the knowledge that I am imparting. I wouldn’t say there is much of a change. From the beginning they were receptive to the idea. In fact, I’ve been asked in India, “Why do you go and preach the philosophy in America? I say, “Why do you think it’s materialistic?” They say, Well, it’s all dollars and dollars and dollars.” I say, “Do you realize that no other currency in the world has what the dollar has ‘In God we trust?’ And you call that materialistic? No pound, no rupiah, no yen has it. They all trust in their currency. Americans trust in God.’ They are very active and dynamic people. I find them extremely open to ideas. There are no biases or prejudices. In other countries they are not so open and definitely not as dynamic as the Americans. That’s why I find that it’s a haven for the knowledge that I’m imparting in this country. Q: Do you find that more Americans are visiting India? A: That’s for a different reason. People from all over the world are coming for business purposes because they believe that India is progressing now. Q: Aren’t more people going for spiritual reasons and visiting ashrams? A: Because India is a land of spirituality and land of ashrams, when they come there they have to visit that. We don’t have Disneyland. We have ashrams. When we come here we visit Disneyland. When they go there they visit ashrams.Q: You don’t go to Disneyland, do you?A: The day before yesterday I went to Disneyland after 40 years. Probably my first visit somebody took me there. I’ve been here every year for 40 years. It was very unusual that I’m free for the day. It was wonderful. It’s an extraordinaire piece of art, which I admired. Q: Did you get on all of the rides? A: A few of them. I’m 84. Q: You’re absolutely amazing. What’s your secret? A: No worries of the past. No anxieties for the future. Everybody’s worried about what happened in the past and anxious about what’s going to happen in the future. If you can cut these two and live in the present, you don’t age. That applies to anybody. Some of the American children of my followers here ask their parents find out from Swami what cream he uses on his face. I don’t use any cream. Q: Is living in the present one of the biggest challenges for people today? A: It is. Worry and anxiety create fatigue. Work never tires you. I’ve been working constantly and have never taken a holiday. I’m not a model. It will happen to any one of you who don’t bother about the past or the future. That’s the secret. But it’s easier said than done. I can tell others but the question is how to do it. It’s a process. I’ve written 11 books. Q: Do you mediate daily? A: Not any more. I passed that stage. Meditation is not meant for an average person. It’s misconceived in this country and Western countries in general. I wouldn’t recommend mediation. It’s like jogging to an invalid. I jog three kilometers every day. I’ve been jogging all my life. If there’s an invalid suffering from heart problems or something else and you ask him to jog — jogging in a good exercise. The question is for whom? Similarly, meditation is meant for people who have calmed their minds and in that last stage they need mediation to get enlightenment. But you don’t start with meditation. It can harm you. No one has really understood the effects of meditation for the unprepared mind.When you’re calm, you meditate. You don’t meditate to get calmness. You’re putting the cart before the horse. When your mind is calm then you’ll be able to meditate. That’s the last gateway to enlightenment, not before. I’ve trained hundreds of students. It’s a three-year course in India and none of them is fit for meditation. They are very advanced students compared to the average person but still they have to go a long way before they can sit down and meditate. Q: Any final words you’d like to share? A: I’ve been telling people to serve and sacrifice is the secret of peaceful life. The secret of harmony in the world is to learn to serve and sacrifice. A meets B. He must think in terms of “Can I be of some service?” When I come here, I don’t know you all. I must have the spirit of serving and sharing not what can I get out of you. That’s a very negative approach to life. That’s what I tell my colleagues, friends and listeners – learn to sacrifice and that’s the best thing that you can do.